Brad Jacobs shouts to his sweepers during his win over Brad Gushue at the Canada Cup in Estevan, Sask. on Dec. 5, 2018. Brad Jacobs’s rink seems to be doing just fine without regular third Ryan Fry. The team from Sault Ste. 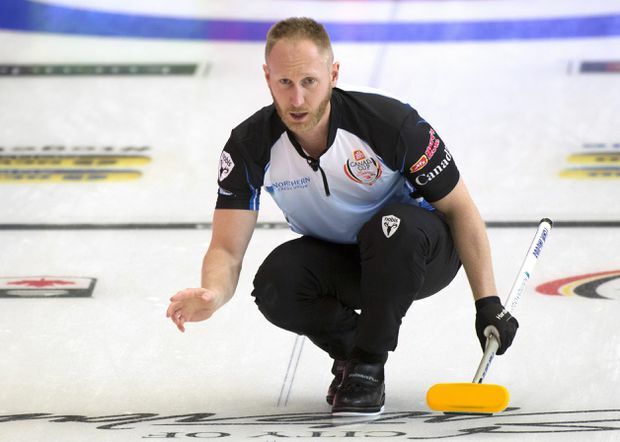 Marie, Ont., which added Marc Kennedy after Fry started an indefinite leave last month following an incident involving excessive drinking with another squad, improved to 3-0 at the Canada Cup with a 5-4 win over Reid Carruthers of Winnipeg on Thursday morning. Jacobs won it on last rock, making a wide out-turn tap of a Carruthers stone partially buried in the four-foot. Kennedy feels the team’s chemistry is strong in his first event with Jacobs. In the other men’s game on Thursday morning, Brad Gushue of St. John’s, N.L., topped Toronto’s John Epping 7-2. In women’s action, Jennifer Jones of Winnipeg suffered her first loss, falling 6-3 to Kerri Einarson of Gimli, Man. Ottawa’s Rachel Homan improved to 2-1 with an 8-3 win over Edmonton’s Laura Walker, while Calgary’s Chelsea Carey downed Casey Scheidegger of Lethbridge, Alta., 7-6. Two more draws will be held Thursday. The playoffs start Saturday.